Let me begin by recognizing the outstanding work of the Creighton University team on the thorny subject of outstanding property claims between Cuba and the United States. Unfortunately, budget constraint did not allow the study team to pursue the issue of claims of Cuban nationals abroad and on the island. Our comments on the Report are formulated with regard to the economic reconstruction of Cuba by a transition government,1 independently of its likelihood, considering that the resolution of the outstanding property claims should not be handled in isolation from such undertaking. To carry out a transition, the Report states: (1) macroeconomic stabilization is necessary; (2) liberalization of the economy is essential; and (3) privatization of the economy is required. As is generally understood, macroeconomic stabilization involves abolishing the central planning system, decontrolling most prices, and unifying and decontrolling foreign exchange markets. A macroeconomic stabilization and reform program in Cuba would also demand a tax system at the municipal and national level and a monetary policy including, but no limited to, the real interest rate and the appropriate exchange rate. These actions would support structural reform, in which a realignment of prices and wages and salaries will play a pivotal role. In addition, fiscal policy reform will require the enactment of legislation establishing a tax structure capable of generating the large revenue requirements for the macro- stabilization program and the financing of a social safety net, including the provision of unemployment payments. The Report raises the potential problems that will have to be faced by a transition government in the process of the economic reconstruction of the country, among them race, housing, property rights, labor, and relations with the United States. The racial issue, which was object of concern during the struggle for Cuba’s independence from Spain, proved not to be of relevance in its aftermath. Hopefully the conviviality that was a trait of the Republic can be restored. At the present time, both Caucasians and Afro-Cubans on the Island are in the same situation of facing shortages and inequities. There is also the significant moral problem presented by the possibility of displacing ordinary Cubans who have been living and working within the existing structure of Cuban society and can be hardly be faulted for their current circumstances. … [There is a] need to assure ordinary Cubans that they will be secure in their homes. In dealing with restitution those legitimate social and political concerns must be handled with heroic measures. In particular, the issue of property rights for the housing sector and the shortage and poor conditions of housing stock are worth mentioning. In order to clarify property rights in the housing sector, a transition government must (1) review all existing rules and regulations that govern the housing sector; (2) declare null and void all the provisions that restrict the undisturbed possession of property; and (3) conduct computer mapping of urban land tenure patterns. Housing Shortage and Condition: There is a welldocumented critical deficit of the housing stock. Moreover, there is evidence of the physical deterioration of dwellings due to lack of maintenance and repairs. Other problems with implications for the labor force and employment levels not raised in the Report are: (1) that during the transformation of a centrally planned economy to a free market economy, the country will be compelled to carry out a reform of the public administration to reduce or even to eliminate some government offices and agencies that are inimical to a market economy and to shift those functions to an emerging private sector; and (2) a reduction of the size of the armed forces and the security apparatus will also add to labor dislocations. Furthermore, the present open and disguised unemployment will be a problem to be addressed by a transition government. Provisions will have to be made to satisfy the basic needs of persons affected by open unemployment that will spring from the rationalization of the economy. The situation will demand a revamped Ministry of Labor with the responsibility of managing both the needs of unemployed workers and of those who are working, paying attention to the demand and supply of the labor force and seeking compliance with the core labor standards of the International Labor Organization (ILO). The Report explains that a transition Cuban government will be in dire need of both symbolic and financial support from the West, adding that the source of the financial support is uncertain. The Report states that some insist that the United States should be the primary financial donor and facilitator of Cuba’s transition due to the geopolitical relation of the two countries and historical experience, while others state that because of the past relationship of the U.S. and Cuba, the U.S. should not be the primary financial supporter or play any role whatsoever in Cuba’s economic transition. And because the development of a democratic and prosperous Cuba is a critical goal for the United States, the American people and their government stand ready to work with the international community to assist a post-Castro transition government. … The proposed program and initiatives to assist a transition government in Cuba are prospective. They are meant to help prepare the U.S. Government to respond to a transition in Cuba. … They are not intended to be a prescription for how a free Cuba organized itself of what policies it decides ultimately to pursue; those remains with the Cuban people as expressed by a free and sovereign Cuban Government. The 2004 CAFC Report contains a large set of recommendations, potential financial aid assistance and technical cooperation across many fields.2 From the recommendations of the 2004 CAFC Report, an action plan for the economic reconstruction of Cuba can be outlined, taking in account that in many fields, project identification has been already done. Of course, the 2004 CAFC Report makes clear: “In particular, in order for assistance to be provided, the prerequisites for assistance to a transition government contained in the Cuban Liberty and Democratic Solidarity (LIBERTAD) Act will be need to be satisfied. The recommendations in this report regarding future assistance to Cuba can be implemented only if those requirements and standard are met.” Thus the critical importance of addressing the resolution of property claims. The Data Analysis Chapter of the Report provides detailed information about the claims of U.S. nationals for both individual and corporations. There were 10,175 such claims filed, of which 7,078 were certified by the Foreign Claims Settlement Commission of the United States (FCSC). According to Alonso and Lago, the certified value of the American claims were in the amount of 1.8 billion U.S. dollars.3 Interest on the U.S. claims against Cuba, accumulated at 6% simple interest, gives an annual accrual of 108 million U.S. dollars. In 47 years, this debt has accumulated interest in the amount of 5.076 billion U.S. dollars, which added to the original amount of 1.8 billion result in a total debt amount of 6.876 billion U.S. dollars. 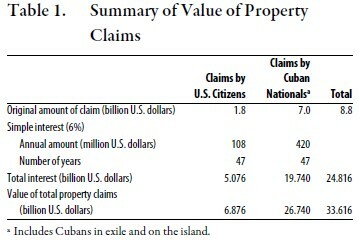 For Cubans in exile and those living on the island, Alonso and Lago came with crude estimates of the value of their claims using two methodologies. The final result of both methods yielded an approximated value of 7 billion U.S. dollars. Considering 6% annual simple interest over 47 years, the amount of these claims raises to 26.740 billion U.S. dollars. It will necessary to have a inventory of the claims in the manner done by the FCSC, which includes land, residences, buildings used for business purposes, personal property, mining sites, other industries involving heavy initial costs and risks, and railroads. 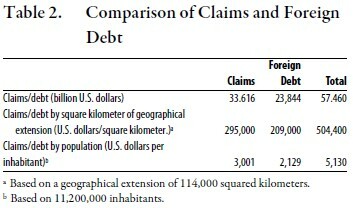 The present value of both original claims gives a total amount of 33.616 billion U.S. dollars, as shown in Table 1. In the context of the reconstruction of the Cuban economy and for establishing the initial condition, the foreign debt of the country must be addressed. Cuba’s foreign debt with 25 countries and undisclosed sources of financing as of November 2007 is about $23.844 billion, of which Venezuela represents 33.6% followed by Spain with 13.4%.4 In addition, there is a debt in transferable rubles of approximately $22.069 billion with the former Soviet Union. As of 1990 the debt in transferable rubles was estimated at 15,490 million. Cuba has never recognized this debt. At the 1990 exchange rate of 850 rubles per dollar, this debt amounts to $18.22 million dollars. The Russians appear to be reluctant to accept the current dollar conversion of the debt. This will be other challenge for Cuba to deal with. As the transferable ruble never was a convertible currency, no fixed value was ever quoted in any exchange market. Table 2 combines claims with Cuba’s foreign debt, excluding the debt with the former Soviet Union. The foreign debt of Cuba in the amount of 23.844 billion U.S. dollars represent 46.7% of the Gross Domestic Product (purchasing power parity) estimated at 51.11 billion U.S. dollars.5 If the value of the claims is added, the total amount will exceed the estimated GDP. The financial burden of the Cuban debt is linked with the interrelationship of the budget of the nation and the balance of payments. Servicing the debt requires income taxation. Cuba is running a merchandise trade deficit, with declining exports and supposedly repressed import demands. Associated with the financial burden of the Cuban debt is the transfer problem, which for Cuba is two-fold. First the limited export base, aggravated by the impairment of the sugar industry and the investments required by the reconstruction of the economy. And second, with regard to the foreign debt, it can be stated that there is a serious case of solvency and not of liquidity. Thus, Cuba falls in the category of highly-indebted, poor countries (HIPC). From this standpoint, a relief scheme (forgiveness) of the sovereign debt instead of a rescheduling could be sought in the Paris Club. A Cuba Special Claims Court, to be established by bilateral treaty or executive agreement, with the sole purpose of resolving property claims by Cuban- American exiles. The justification for the creation of the Special Claims Court, according to the Report, is that Cuban judges may lack the resources and legal professional experience necessary to handle post-Castro property claims. One observation about those arrangements is that both, United State and Cuban national citizens must be on the same footing, consistent with the Calvo Doctrine (Carlos Calvo, Argentine international jurist) that affirms the right of Latin American countries to demand that foreigner submit theirs claims to the local jurisdiction before seeking the protection of their government. In brief, the foreigners are equal to the natives before the law of the country. The legacies of the Castro regime preclude the application of the Calvo Doctrine. On options for the resolution of the claims, the Report states that a large loan on favorable terms from the United States and/or international financial institutions could make it possible to compensate claimants with a lump-sum payment. Due to the large amount of the claims (33.616 billion U.S. dollars), this alternative does not appear to be feasible. Moreover, the lending policies of international financial institutions probably would not allow for loans of this kind. Besides, loans from the international financial institutions will be needed for the reconstruction of the Cuban economy. As the Report states, there are some fairly clear pros and cons and complications regarding restitution and compensation as mechanisms to deal with property claims. In general, restitution strategies have the advantage of making a decisive break with a previous regime; clearly establishing the priority and validity of property rights; costing the state treasury less than paying compensation to previous owners; providing a clear title for owners of restituted property, which may ease issues of property governance and encouraging new investment; and stimulating markets in property and thereby leading to higher economic efficiency uses. However, neither restitution nor compensation avoids serious problems. The Report asserts that the experiences of East and Central Europe suggest that a mix of the two is the least-bad alternative. Compensation will probably need to be paid for residential and agrarian properties to avoid social and politically dislocation and discontent, and to avoid lengthy and costly legal deliberations. Large commercial or industrial enterprises, particularly where they are undercapitalized and in bad repair, may be better candidates for restitution. This could be in the interest of a transitional government seeking to avoid costly capital compensation obligations and encouraging increased capital in-flows. In the specific instance of Cuba, and in relation to restitution of property pursuant to claims by Cuban nationals, Cueto6 calls attention to: (1) property that simply no longer exists, such as buildings and other physical structures which have collapsed, or which have torn down to build other structures; (2) property that although it has not physically disappeared, has been significantly transformed; and (3) property that has deteriorated physically. The images presented in the Report confirm these findings. In the case of factories, obsolesce is a negative factor, while with respect to agriculture farmland, there is evidence of negative ecological impact of large soil erosion, salinity and deforestation. Restitution Schemes: For Cuba, restitution seems to be a suitable solution in the case of: (1) factories; (2) commercial enterprises; and (3) farm lands. Prerequisites for restitution might include that the party be willing and able to operate the asset and support operations with a sound business plan and that the asset be delivered on an “as is” condition. The claim by the International and Telegraph Company (ITT), in the amount of 130.7 million U.S. dollars. A Mexican firm purchased 49% of the Cuban Telephone Company for 1.5 billion U.S. dollars, which includes 50.7 million awarded in 1967 and an additional claim for 80.0 million U.S. dollars. The case of the Moa Bay Company, with a claim of 88.3 million U.S. dollars. The current value of this company is estimated at 5–7 billion U.S. dollars. Issues of compensation also need to be analyzed in the context of each scenario. Under the partial privatization scenario, Cuba has difficulties meeting Cuba exile and US/Cuba claims. Under the full privatization scenario Cuba can meet all its claims and obligations after close to eight years without undue sacrifice in the rate of growth. However, in all instances analyzed, paying claims and debts lowers the rate of growth. Alonso and Lago’s conclusions must be qualified in the light of developments since their 1994 study. Since then: (1) the sugar industry that was projected to be the cornerstone of exports and of the balance of payments has collapsed; (2) the foreign debt, estimated at 6.094 billion U.S. dollars in 1994 has increased 3.9 times to 23.844 billion U.S. dollars; (3) interest on U.S. claims and on claims of Cuban nationals have climbed significantly. The outlined restitution scheme, if accepted by the claimants involved, presumably would help significantly in the resolution of the outstanding property claims. That will leave three categories of claims—small claims, transformed properties, and residential and rental urban units—as candidates for compensation. A major problem for the adjudication of compensation will be valuation of residences and housing claims. The rental value of dwellings, due to the low monetary income of the occupants, would result in a very low valuation. Therefore, a formula for the valuation of housing claims must be worked out. To finance the compensation component of property claims, an ad hoc compensation fund could be created with the proceeds from the sale of small and medium enterprises, an earmarked income tax surcharge on the tourism industry, royalties from mining, recoveries from improvements in farm land, or (when this becomes possible) from the sale of livestock (cattle). In discussing the transition scenario, the Report states that a requirement of such scenario will be privatization of the economy. Privatization, according to the Report, includes the development of a new private sector and reformation of management and ownership of former state-owned enterprises (SOE) via restructuring, commercialization, liquidation, and establishment of clear property rights. In our view, the privatization scheme must be worked out in conjunction with restitution of confiscated commercial enterprises. Goals of Privatization: The goals of privatization should be: (1) to attract direct private investment as quickly as possible; (2) to foster the re-emergence of the domestic enterprise sector; (3) to attract private direct foreign investment with the expected benefits of the transfer of technology and enhanced markets; and (4) to fund a social security institution. Priority should be given to direct investment as this would increase installed capacity and bring the benefit of job creation. The rules for privatization must be clearly spelled out and the process transparent. Privatization of Enterprises: With regard to the privations of large enterprises (state-owned/controlled enterprises), to carry out this process it will be necessary first to establish the viability of the enterprise and then to take additional steps such as incorporating the enterprise as a stock company; transferring the shares to a social security fund; targeting strategic investor with the experience, resources and know-how to restructure the enterprise and make it financially viable. Privatization of medium-size enterprises could be accomplished through a management-employee buyout system, by selling the enterprises with term financing appraised at border prices of the machinery and installations of the enterprise, and a technical cooperation plan to assist the enterprise in managerial practices, marketing, cost accounting, and financial management. Privatization of small enterprises can be accomplished by selling the enterprises to the actual operator with term financing, valuing the productive assets at border prices. Completion of the valuable work done by Creighton University is important, particularly the examination of claims by Cuban exiles and by Cuban citizens on the island. Also important is to develop the system of taxation after restitution. Our comments on the report were based on the scenario of the establishment of a transition government in Cuba capable of putting in place the needed structural changes to carry out the resolution of outstanding claims. It is imperative that Cuba transform itself from a centralized, war economy to one of free initiative and peace, and that this be accomplished with a sense of urgency due to the stagnation being endured by the country and beyond that for a reason of humanity. Building up from the information of the Report and others sources, and based on a frame of reference that consider the social and economic condition of the country, a multidisciplinary group could be assembled to put together a blue print for the reconstruction of the Cuban economy. 1. The Report defines two different scenarios: (1) Succession. A change in leadership within a pre-existing regime. Signals continuation of the regime while providing means of renovating through the installation of a new leader or leaders; and (2) Transition. A government defined by the presence of regularly scheduled, free and fair elections. Government actions promote and respect internationally accepted definitions of human rights and other democratic rights and norms. 2. For example, see recommendations in Chapter 2, Meeting Basic Human Needs in the Areas of Health, Education, Housing, and Human Services; Chapter 3, Establishing Democratic Institutions, Respect for Human Rights, Rule of Law, and National Justice and Reconciliation; Chapter 4, Establishing the Core Institutions of a Free Economy; Chapter 5, Modernizing Infrastructure; and Chapter 6, Addressing Environmental Degradation. 3. José F. Alonso and Armando M. Lago, “The Foreign Assistance Requirement of a Democratic Cuba. A First Approximation.” London. April 1994. La Sociedad Económica. 4. “Cuba’s Mortgaged Future: Castro Regime Foreign Debt, 2007.” Cuba Transition Project, Institute for Cuban and Cuban-American Studies, University of Miami, Cuba Facts, Issue 37, March 2008. 5. “Cuba in Context: National Debt and GDP.” Cuba Transition Project, Institute for Cuban and Cuban-American Studies, University of Miami, May 2008. 6. Cueto, Emilio. “Property Claims of Cuban Nationals.” Paper presented at the Resolution of Property Claims in Cuba’s Transition Workshop, sponsored by Shaw, Pittman, Potts & Trowbridge. Washington D.C. January 1995. 7. Timothy Ashby, “Taxation of Cuban Confiscated Assets after Restitution.” Institute for Cuban and Cuban American Studies. University of Miami. December 20, 2005.